You are at:Home»Herbs»Linum usitatissimum Linn. Latin name : Linum usitatissimum Linn. Description : The seeds are analgesic, antiinflammatory, antiseptic, antitussive, aphrodisiac, cardiotonic, demulcent, diuretic, emollient, expectorant, nervine, pectoral, purgative, resolvent and tonic. Flaxseed is also a gentle laxative. It is used to treat long-term constipation and for colons damaged by abuse of laxatives. It is high in fiber and a gummy material called mucilage. These substances expand when they come in contact with water, so they add bulk to stool and help it move more quickly through the gastrointestinal tract, thereby acting as a laxative for constipation. Flaxseed is rich in two major healing factors, omega-3 fatty acids (50% more than the amount available from fish oil), and lignans. Flaxseeds are the most abundant source of compounds which can be converted by bacteria in the gut to lignans, special compounds which are demonstrating some rather impressive health benefits. The benefits include positive effects in relieving menopausal hot flashes, as well as anticancer, antibacterial, antifungal and antiviral activity. The mucilaginous infusion of the seeds is used internally as a demulcent in coughs, catarrh and bronchial affections. Lipid-reducing and sugar-reducing effects have been demonstrated in various studies. Several studies, some conducted in people, suggest that flaxseed products may help to keep the heart and cardiovascular system healthy. Flaxseed products may lower cholesterol levels, help control blood pressure, and may reduce the buildup of plaque in arteries. Test tube and rat studies suggest that chemicals in flaxseed may help to prevent or shrink cancerous tumors. Due to its estrogen-like effects, some women use flaxseed oil to ease breast tenderness, alleviate symptoms of premenstrual syndrome (PMS), and help control menopausal symptoms. 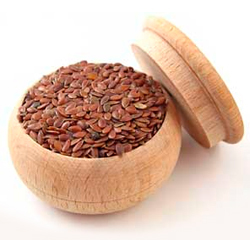 Flaxseed oil has also been recommended to treat skin conditions, inflammation, and arthritis. It is usually taken internally for all the purposes mentioned above. The oil may be used externally to help the healing of scalds and burns. More recently, flaxseed has been shown to be beneficial for people suffering from digestive disorders. It is now recommended as an “effective herbal agent” for treating irritable bowel syndrome (IBS). The link between flaxseed and heart disease has been examined in a number of published studies. One of these studies published in the journal Atherosclerosis in 1997, observed the effects of adding flaxseed to the diet of rabbits with atherosclerosis. Researchers found that flaxseed reduced the development of plaque buildup by almost 50%. The authors concluded that flaxseed may help to prevent heart attacks and strokes related to high cholesterol levels. A study involving several dozen men with mild high blood pressure, which was published in the Journal of Human Hypertension in 1990, suggests that flaxseed oil may slightly lower blood pressure. Recommended Dosage : Seeds : 5 to 10 g powder of dried seeds with sufficient amount of liquid (1:10); Oil : 7 to 14 ml.